Kitch.in is India's first natural cookware brand that delivers hand-seasoned natural cookware right to your kitchen. Clay pot cooking always results in aromatic food. Earthenware has always been an intrinsic part of Indian households. 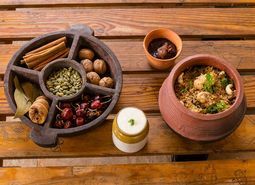 When Mughlai cuisine meets earthenware, we can expect delicious, healthy food.